Google Algorithm Shifts This Morning: Penguin Completing Or Panda Refreshing? 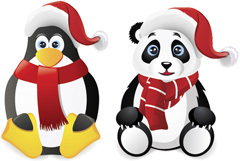 Home > Google News > Google Updates > Google Penguin Updating Or Google Panda Refreshing This Morning? I am seeing early but significant chatter this morning around Google algorithm and search results changes. Some are saying it is Penguin related and some are saying it is Panda related. It is too early to tell. Panda does tend to refresh every few weeks or so but Penguin may still be rolling out and updating. So it is unclear. Yes, something happened in the UK late last night or this morning. I think it may have been Panda related but it's getting very difficult to tell. Yea im still noticing a good amount of dancing over past few days, still steady link building but hoping things will settle soon. Starting to see quite a bit of shuffling again... not sure what to make of this anymore. At least the crazy results from Tuesday have not made a reappearance! Yes, my site which went from page 2 to 12, got back to page 7 like 5-6 days ago, yesterday got back on page 2-3, dancing between 2 and 3. So I guess I didn't get penalized. Maverick was right. This may be normal flux or it may be a sign that Panda is refreshing, once again or that Penguin 3.0 is settling down?